Partez à la découverte du quartier français de La Nouvelle-Orléans avec un guide instructif qui vous raconte des anecdotes sur l’histoire et l’aspect surnaturel de ce quartier historique. Visitez des lieux importants tels que la cathédrale St Louis, Jackson Square et les sites clés de la vente de la Louisiane. Apprendrez-en plus sur la « reine vaudou » Marie Laveau, découvrez les lieux où se tenaient les cérémonies vaudoues et visitez une maison hantée. Votre guide vous donne du temps pour vous acheter des boissons dans les bars le long du chemin, et vous pouvez également utiliser un équipement paranormal authentique. 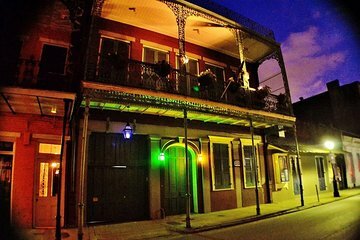 Cette excursion divertissante de 2 heures fournit une approche fascinante sur Big Easy. Such a fun tour! Definitely wear some walking shoes because you'll be walking all over down town! Our tour guide, Ashley, aka Trashley was hilarious and super sweet. Would totally do this tour again. Hopefully you get her if you get this tour. Plenty of time to stop at bars to get new drinks while walking around. The tour guide, Ashleigh, was amazing! We had a really fun group of people too. Great way to make new friends and socialise. A lot of fun and great local stories. Getting to carry the K2 meter was an added bonus! Enjoyed the history but enjoyed the stops at the bars for drinks better. Besides hauntings, we learned about the history of Voo Too and vampires. Way cool. Tour was just ok to be honest. Could have used a more enthusiastic approach. You get to see some interesting places and bars. I just feel like it could have been better. This tour was outstanding and Ashli was an excellent guide. We had originally scheduled the tour for the afternoon and ended up changing to an evening tour. I think the darkness added to the interest of the tour. Felt more like a ghost story tour, with made up or real, whatever stories about people long ago who lived here, or did such and such over there. We were hoping for more real-life history about the town, the buildings, etc. as we imbibed our way around town. Our guide was very nice, but also very soft-spoken. We were a group of 10 in addition to others on the tour and each of us said it was just okay. great tour and guide told us some great stories about things in the area. This was so much fun. Not too long, very entertaining, and plenty of drink stops! You should definitely do it, especially if its one of your first trips to New Orleans.